The United States Forest Service (USFS) makes extensive use of computer models and Geographical Information Systems (GIS) as part of their Wildland Fire Assessment System (WFAS). The aim of these systems is to predict and hopefully prevent wildfires using data about weather conditions likely to cause outbreaks. Handily for ITGS students, several of these tools are available online. 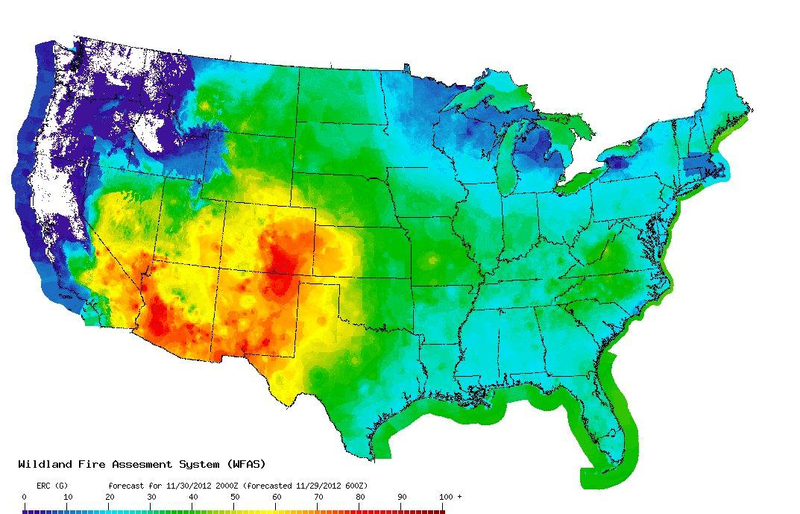 The first tool is a Geographical Information System (GIS) that plots data layers including NDVI (Normalized Difference Vegetation Index) and “Greenness” information across the US. This gives an indication of the current level of vegetation cover (which obviously changes according to the season). This data can be used with fire risk computer models to predict the areas most susceptible to wildfires. Click below to open the GIS (This data can also be downloaded as a KML file for use in Google Earth). Another tool gives a good indication of the variables that must be considered by fire-risk models. The National Fire Danger Rating System (NFDRS) Fuel Model maps the various types of “fuel” across the US – from hardwood leaf litter to grass and agricultural areas. Fire risk computer models needs to consider these different types of terrain as they have a significant effect on how likely fires are to develop and how quickly they might spread. To actually predict fire risk, the Display Forecast Energy Release Component is used. This (in short) uses data from two computer models: first, the National Digital Forecast Database is used to predict weather in the selected time period (up to 6 days away). The data from this model is then used in a fire forecast computer model (which takes into account data such as vegetation cover and type) to predict the areas with the highest fire danger. Because large tables of figures can be hard to interpret, this data is then plotted visually on a map (see below). The data generated by these computer models is available in several formats. One of the most useful for ITGS students and teachers is the KML format, compatible with Google Earth. The map below is linked to an auto-updating KML file that includes both current (observed) and future (predicted) weather conditions across the US, and an associated fire risk based on these figures.